Sartre's existentialism faces the evil in human existence and sees that humans are responsible for it. He doubts man can make moral progress, yet he embraces the possibilities for human life. Mankind is radically free and responsible. In every moment we choose ourselves; beyond this, we find no instructions for our lives. 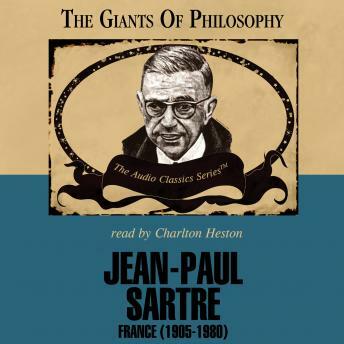 No external authority gives life meaning, so Sartre's existentialism is boldly atheistic. For most objects, "essence precedes their existence." But humans must continually create what they are in every moment; human existence precedes essence. "Existence" hides behind the way we see and talk about it. Conscious life is a type of "Nothingness"; we determine what we now are by the way we project the "not yet" of the future (we are not what we are, and we are what we are not.) Anguish before the future is one way we experience our radical freedom. We're not determined by outside forces; we constantly choose and re-choose ourselves with no assurance that we have a continuing identity or power. So we set up determinisms to ease our minds. An unstable and unpredictable human condition afflicts all human relations. We can't escape our involvement with others; conflict is inevitable. Death is the ultimate limit; the end of consciousness is the end of meaning.